I love this student solution to measure high myopia centimeters! If you have really high myopia and try to measure your centimeters, you already realized how frustrating it can be. Getting that close to the screen, trying to measure tiny changes, it’s far more difficult than if you have average myopia. Read this post on the topic, which also points to a much more detailed discussion in our FB group. 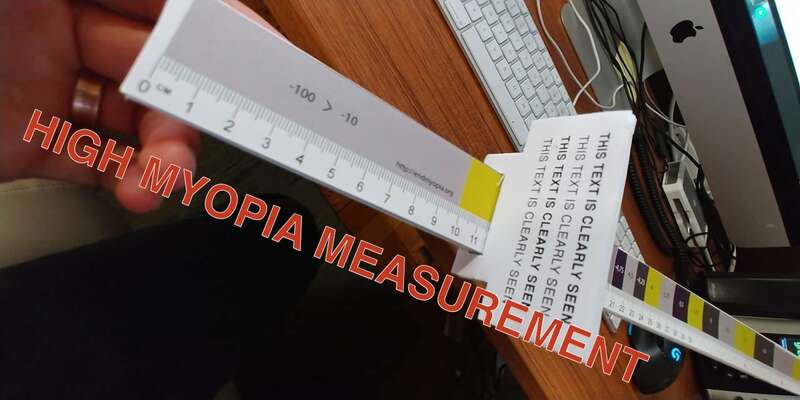 In the Facebook thread, I re-post (from the BackTo20/20 forum) as Laura describes how she made an incredibly accurate, easy-to-use, and fun tool to measure her high myopia. It’s ingenious really and you can make your own, without having to spend any money! When I first tried doing cm measurements, like you, I found that the high myopia made it difficult to impossible, so I made a little tool. Tape measure, foil tin from a takeaway, clear plastic from some packaging or other, and some mouldable glue (Sugru – brilliant stuff). I get millimetre accurate readings from it, doing each eye separately. I don’t do both eyes together at the moment, because of the eyes crossing thing. It is definitely motivating – when I started I was frequently below 9cm, but today, for example, I am 10.7cm left eye, 10.5cm right eye. Sounds small, but that’s high myopia for you. I am looking forward to the point at which changes become noticeable in centimetres instead of millimetres – it’s convenient that the way the optics works means that we will be rewarded with bigger leaps in measurement as the diopters go down! Super super cool, this one. You’ve got 1) the blog, 2) the Facebook group, 3) our Quora corner, 4) the YouTube channel, and 5) BackTo20/20 to help you on your quest to get those eyeballs back in order. That’s a ton of tools, and a whole lot of people participating and sharing advice and experiences. We have participating optometrists, we’ve got renegade scientists building new 21st century eye chart alternatives (Allan and the Dyop), and we’ve got lots of eye gurus (and eye gurus in the making). 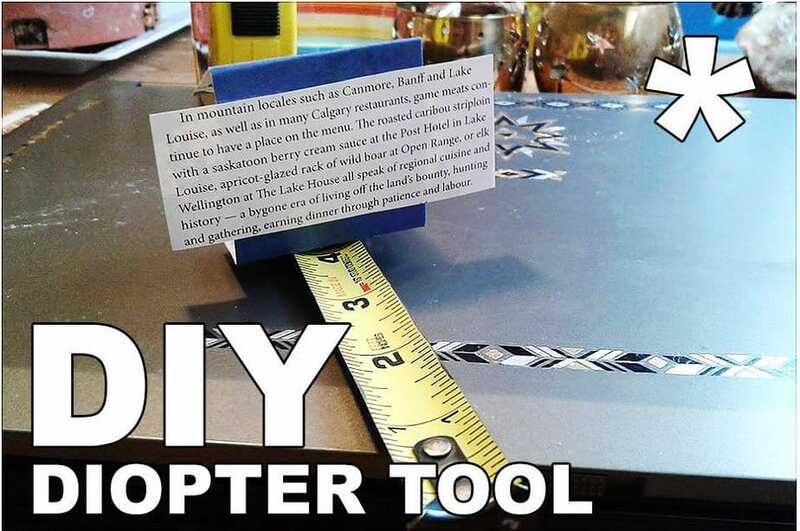 Other cool DIY tools: Astigmatism diopter measuring system. 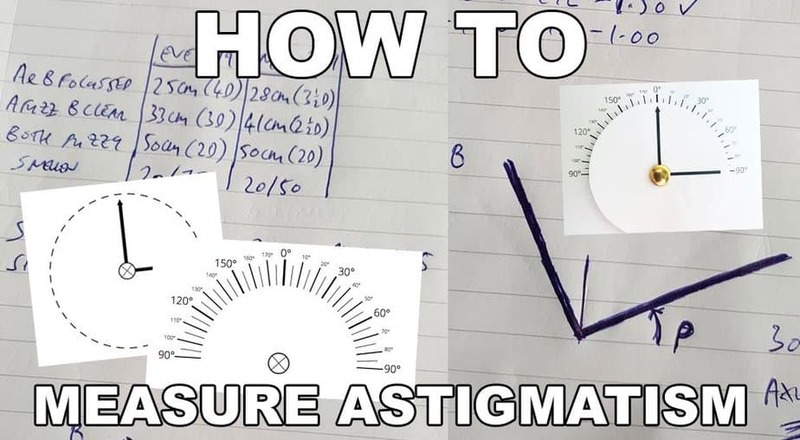 Best astigmatism measuring tool guide online! 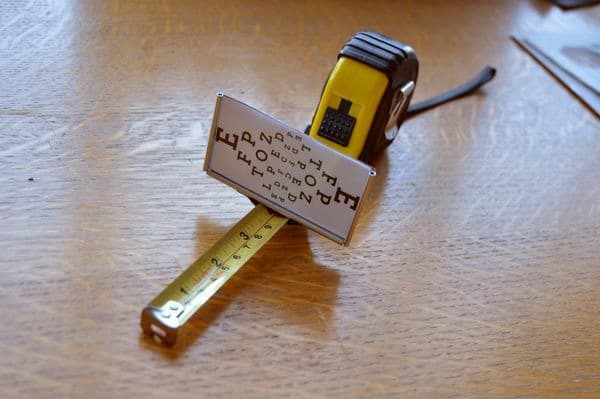 Update: Here’s another DIY diopter measuring tool, also very simple to build.